Since I’ve got some Anko bean paste left from making my new year treat (remember my deep fry fail? ), I’ve been trying to think of ways to use it up. And today is Chinese Valentine’s day, traditionally we have to eat something sweet, and anko paste sounds perfect! First thing came to mind was Dorayaki, so here I was, like a mad woman I started making them after sending J away to Sainsbury’s. 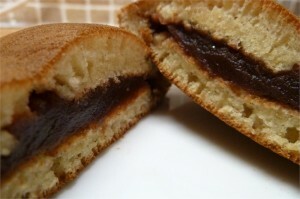 Dorayaki is a traditional sweet treat in Japan, it is basically 2 honey pancakes with anko bean paste in the middle. And it’s the favourite food of Doraemon!! Doraemon was my favourite cartoon when I was a kid. My brother and sister used to buy all the comics and I’d read them all, over and over again. And when I was a kid I wouldn’t have dreamt of having a Dorayaki, since it is such an expensive imported Japanese thing. But then in my late teens, I’d go to Citysuper in Hong Kong to buy one for a treat, very rarely. And now I suppose it became even more of a luxury since I live in Northampton, a small town which I think 95% of the population http://pharmacy-no-rx.net/celexa_generic.html wouldn’t even have heard of it. In a big bowl, stir together the eggs, sugar and honey. Add the flour, baking soda and baking powder to the mixture above. Stir until well fixed. Add the water gradually and stir until well mixed, it should have a consistency like double cream. Heat a frying pan up, and cook them like you would cook pancakes. Depends on the size of your pan, only do 2 or 3 pancakes at a time. Otherwise they will all join together. When you see bubbles forming, flap them over. Cool all the pancakes and then sandwich your anko paste in the middle. I work with Japanese colleagues and one of my friends brought dorayaki today because it was his birthday. He told me what they were called, which led me (via Google) to this webpage of yours. Thank you for the recipe: now I can try to make them myself! They are very tasty! You’re most welcomed! It is a lovely lovely treat. If you do make it, please let me know how it turned out! Hi! I just came across this site while searching for dorayaki (Just tasted my 1st one from the store) I wanna try making Doraemon’s favorite snack, but I how do you make the anko paste? Is it the same as the red bean? Copyright © Annie Ko and Annieko.com 2014. Unauthorized use and/or duplication of this material without express and written permission from this blog’s author and/or owner is strictly prohibited. Excerpts and links may be used, provided that full and clear credit is given to Annie Ko and Annieko.com with appropriate and specific direction to the original content.